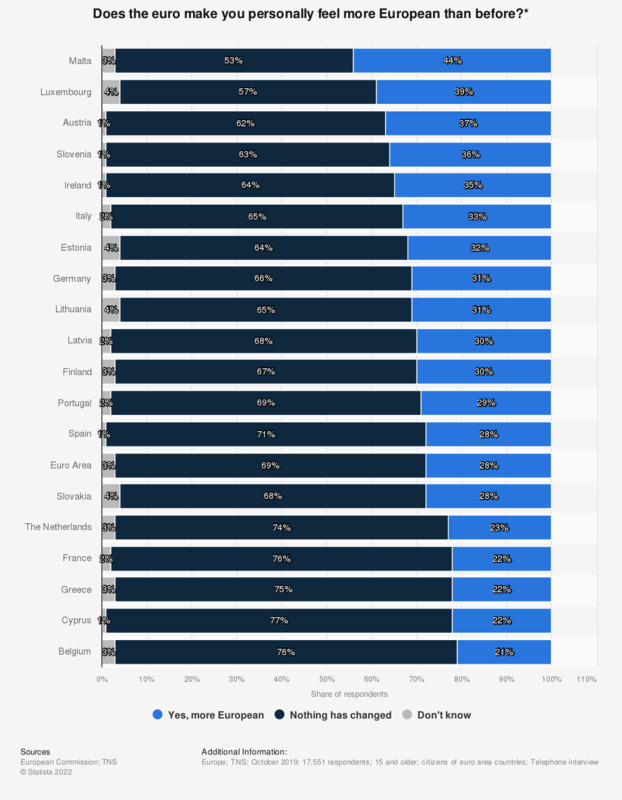 This statistic illustrates the general opinion of the eurozone countries citizens with regards to the impact of euro currency on European identity ("feeling European") as of 2018, broken down by country. It can be seen that the impact of the euro on European identity for members of the population in Malta was comparatively good, with 40 percent of respondents stating that the euro currency makes them feel more European. On the other hand, the share of people stating that the euro makes them feel more European in Greece stood at 20 percent for the same time period. Overall, the share of the euro area population stating that the euro makes them feel more European stood at 27 percent as of 2018. * The full question read as follows: "Does the euro make you personally feel more European than before or would you say that your feeling of being European has not changed?" The euro is the official currency of 19 Member States of the EU: Austria, Belgium, Cyprus, Estonia, Finland, France, Germany, Greece, Ireland, Italy, Latvia, Lithuania, Luxembourg, Malta, the Netherlands, Portugal, Slovakia, Slovenia and Spain. These countries are collectively known as the euro area.